Friday is pizza night at our house which usually includes a movie and/or games. Pizzas are usually homemade, from crust to sauce and even mozzarella cheese. Some weeks they are completely from scratch, Some weeks are east going with fast crusts or even, gulp, frozen. Yes, we do. We have frozen pizza .. Once In A While. Life gets fast and although there are super easy homemade alternates, at times I am just too tired. That said…I think I will make some pizzas and freeze them, just for those busy nights. These are great pizzas without sauce. You could add garlic, parsley, basil, oregano (you get the idea) to the dough. Diced chicken and mushrooms would be great on this pizza. Oh…and, spinach! Let's make some pizzas. When I told my oldest son I was making eggplant parmesan the other day, he asked me to make him eggplant pizzas. I am so glad he did! I made both eggplant bruschetta and pizza. Both are amazing! Friday night is pizza night for us. We love it! It is a time when we are all in the kitchen, making our favorites or creating new ones. My oldest son wanted a white pizza. We came up with a yummy Alfredo one! 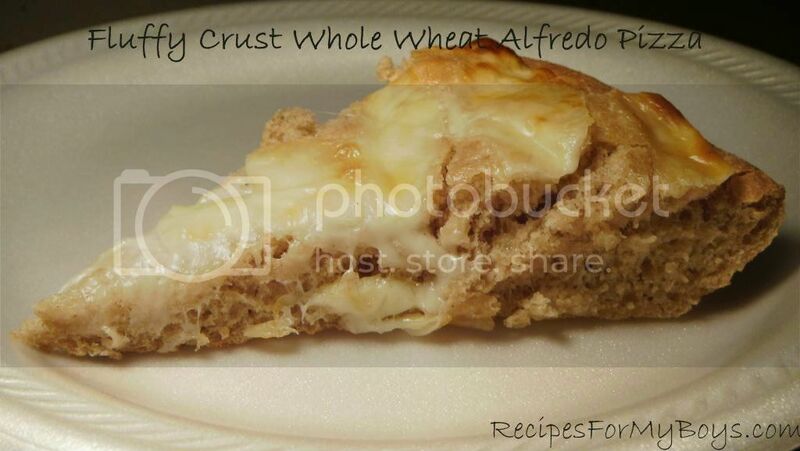 It has a thick and fluffy, crust that has a hint of garlic and parmesan cheese. Next time I'll cook it on a baking sheet and cut into squares. Feel free to add any and everything you wish. It will be amazing! I adapted this recipe from the back of a package of Fleischmann's Pizza Crust Yeast. I love it! 1/2 cup Alfredo Sauce or Spread, homemade or bought. Use more or less, you decide. Grease pizza pan or baking sheet with sides. Put 1 cup whole wheat flour, sugar, garlic, parsley and yeast in a large bowl. Whisk together. Stir in very warm water and oil. Add more flour, a little at the time, until a soft dough is formed. I kneaded dough with a fork sticky and adding the flour. Stir, knead with fork, add more flour, stir, knead with fork.....you get the idea. After dough is soft, turn out on floured surface and knead until smooth and elastic adding a little dog at the time if needed. I kneaded the dough with my hand in the bowl. Stretch and pat dough to fill pizza pan or baking sheet. Top with Alfredo Sauce or Spread. Top with mozzarella cheese and any additional toppings you like. Let pizza sit for 20 minutes. Preheat oven to 425 degrees F the last 10 minutes, more or less, of resting. You know how long it takes your oven to preheat. Bake on bottom rack for 8 minutes, check and turn around cooking another 4 to 7 minutes if needed. Crust will be very soft and fluffy. A fun way to celebrate St. Patrick's Day! Turn your corned beef and cabbage into a delicious pizza! The boys were eating a pizza last night and I didn't want all the cheese and crust theirs had. I decided to look around the kitchen to see what I could find. Ingredients were: Tube of Big Biscuits, Alfredo Spread, Parmesan, an Onion and left over Sausage Links from breakfast. I grabbed my CIS and a yummy pizza was created. Make if for breakfast to appetizers...it's great anytime. I also made one with canned peaches, alfredo spread and parmesan...it was pretty good combination! Unroll and arrange wedges on two cookie sheets. I lined mine with parchment paper, you don't have to. Now, the fun begins! My Boys put the spaghetti sauce on top of the wedges, over and beyond. ~smiles~ They then pull apart the string cheese. 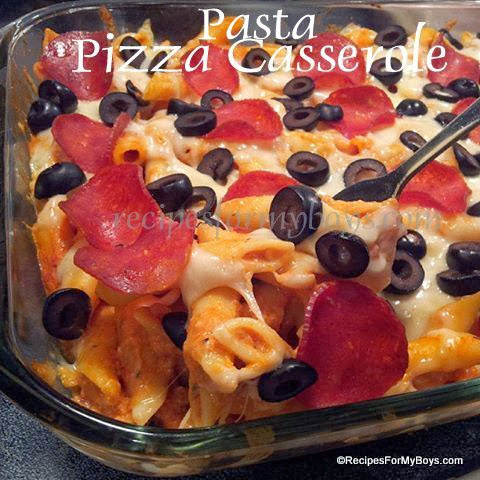 You can use already grated cheese but this adds more hands on fun. Put the cheese on and you choice of toppings. I cooked mine for half the time stated. Then turned the broiler on low just to heat up the cheese more for, 30 seconds to 1 minute keeping a watch on the slices with the door open. Please note, the cheese will not melt like grated cheese.